There are a few types of badminton shots that are commonly used in badminton games today. On this page, you’ll get to know more about the various shots and how to use them wisely to win your rallies. This is the most basic badminton shot. Every beginner should first master this. The defensive badminton clear is performed to get you out of trouble. firing continuous attacks on you. The pictures above show you the flight trajectory of the defensive badminton clear. This shot can be performed using the badminton overhead stroke and the underarm stroke. In the picture above, you’ll realise that the shuttle travels high up and deep into your opponent’s baseline. The defensive clear keeps the shuttle in the air for quite a while. This gives you some extra time before your opponent is able to hit it. Make use of this “extra” time to reorganize your footwork and get back into position. Click here to see the tutorial for the defensive badminton clear. back of the court and is usually used to maintain the pace of the game. – because it keeps the shuttle in the air for quite a while. The drop shot, on the other hand, maintains the pace of the game. similar pace or a faster pace than your opponent. If you can’t keep up with your opponent’s pace, clear (or lob) the shuttle instead. Click here for the tutorial page for badminton drop shot. The smash is often known as the ‘winning shot’ in badminton. It’s used with the intention to end a rally. The smash is one of the most powerful badminton shots (apart from the jump smash) that is fired from a steep angle. However, when you decide to smash, you’re taking a risk. Smashing causes you to lose a certain degree of balance. Thus, make sure that your smash will win you a rally point, or at least force a very weak return from your opponent. 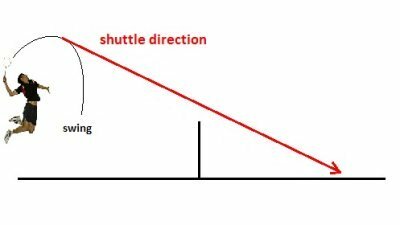 Get behind the shuttle as early as possible so that you are able to hit the shuttle when it is still high up. This allows you to smash the shuttle at a steep angle. Maintain extremely good body balance before you smash. Make sure that your opponent is off-guard. This means that your opponent is not ready to retrieve the smash. If you do not satisfy the conditions above, hit the drop shot instead and wait for another chance. You’ll be taking unnecessary risks if you fire a smash without satisfying the conditions above. Without you knowing, you may be giving your opponent the chance to counter your smash! Click here to see the tutorial for the badminton smash. This is a more powerful version of the badminton smash. It is also one of the hardest badminton shots to perform. The badminton jump smash is the most powerful offensive shot in badminton. Remember, the conditions for performing a smash (mentioned above in “badminton smash”)? You’ll need to satisfy those conditions before performing the jump smash. Click here to see the tutorial for the badminton jump smash. Badminton shots along the net (known as “net shots”) are used to create opportunities and dominate the front of the court. that you can play a winning smash. A tumbling net shot enables the shuttle to tumble across just slightly above the net. A tight spinning net shot will force your opponent to lift to the mid court area. An extremely good net shot (shuttle lands on the top of the net and then drops to the other side) can sometimes be the ‘killer shot’. Click here to learn the spinning/tumbling badminton net shot. executes a poor quality net shot (net shot that is too high). When your opponent plays a net shot that is too high, strike with a net kill! 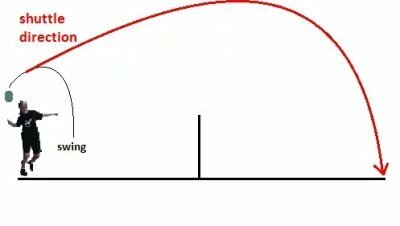 The picture above shows you the flight trajectory for the badminton net kill. Click here to learn the badminton net kill. In some instances, your opponent might be very good at net play. They may perform extremely good badminton shots along the net. When you’re finding it difficult to retrieve your opponent’s badminton shots along the net, perform the defensive net lift. striking with a net kill. The net lift sends the shuttle high up to your opponent’s baseline. usually performed very closely to the net. 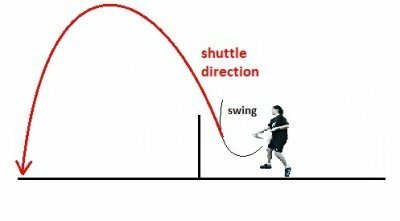 Therefore it is important that you practise to lift the shuttle high enough so that the shuttle won’t hit the net. Click here to read more on badminton net lift. Drives are fast and furious badminton shots exchanged horizontally across the net. One of the main reasons to hit the drive is to increase the pace of the game. Use this only when you’re comfortable with the pace of the rally. If for some reasons you are not performing well or making many unforced errors, DO NOT play drives with your opponent. Click here to learn how to drive.